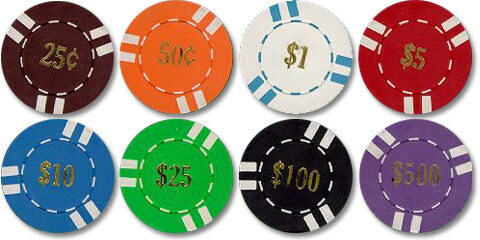 Our 6-Stripe Clay Casino Chips are pre-denominated in 25 cent, 1 dollar, 5 dollar, 10 dollar, 25 dollar, 100 dollar, and 500-dollar values. Each denomination comes in one of eight unique colors (for example, our 25 cent chips are brown and our dollar chips are white). The values are imprinted in gold on both sides of the chips. The minimum order is 25 chips. Pre-denominated clay casino chips are in stock for same day shipment.